Functions of CPR whole body simulated human: there is built-in lithium battery in simulated human, which is applicable for outdoor CPR training and examination. 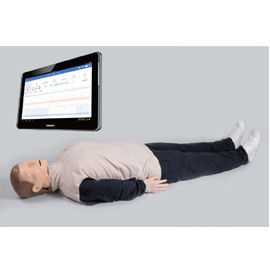 During training mode, it is able to perform procedure training, including judging the environmental safety, dial an emergency call, take foreign body out from the mouth, pulse evaluation time. During the whole training procedure, it synchronously shows compression, air blowing, circulation counts and operation log of students. Error messages including compression interruption time, excessive compression, insufficient compression, multiple compression, few compression, insufficient rebound, wrong compression position, fast air blowing, blowing to stomach, repeatedly air blowing, few air blowing, etc. When the training is over, system will automatically give data statistics and transcript. During examination mode, user could set up examination parameters by themselves, including examination time, compression interruption time, compression frequency, compression accuracy, air blowing accuracy, air blowing time, pulses evaluation time, etc. During the examination, system synchronously shows operation curves of simulated human, operation data statistics and operation log. Teacher could evaluate humanistic care, position of simulated human, compression techniques of students. When the examination is over, system will automatically judge whether the operation is qualified, and give the data statistics of the whole CPR procedure and transcript. Teacher can comment on students’ overall operation and input on transcript. Teacher can manage the transcript of students, transcript could be exported and printed. Simulated human is connected through wireless method. There is built-in lithium battery. Its working hour is not less than 6 hours. It can display vital signs and operation state like the normal pupil and dilated one; pulses; oral foreign body; lift head and jaws consciousness judgement, etc.